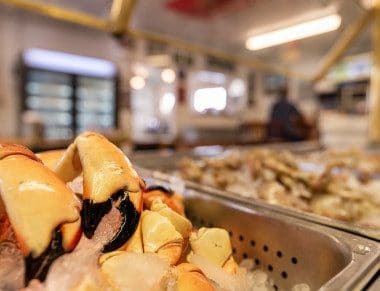 Discover the finest seafood Florida has to offer at Lynn’s Quality Oysters! A top-rated seafood market in Eastpoint, we serve up fresh-caught local delicacies directly from the boat to your table. Our fresh caught oysters are harvested straight from the rich waters of the Apalachicola Bay. In addition to world-famous Apalachicola oysters, we also offer scallops, shrimp, crabs, lobster and all other varieties of Florida seafood. If you’re looking for any type of Apalachicola seafood or St. George Island seafood, you’ll find it here at Lynn’s. Our fresh, local oysters are harvested straight from the Apalachicola Bay. With a tender to firm texture, oysters are a meaty, extra-lean, high quality source of protein. The flavor varies from salty to mild. We sell oysters in the shell or freshly shucked. Oysters in the shell are sold by the bag, half-bag, party box and by the dozen. Our shucked oysters are sold by the pint or in 4 to 8-pound gallons. We carry bay (or calico) scallops and sea scallops. Scallops are sweet, succulent, extra lean meat with a delicate flavor. Bay scallops are the sweeter of the two but smaller in size (about ½ an inch in diameter). Sea scallops are larger at about 1½ inch in diameter. Low in fat, shrimp are crisp in texture with a sweet, distinct flavor. We sell three sizes of shrimp. Our smallest sizes include 36 to 40 shrimp to a pound. Our medium shrimp contain about 26 to 30 shrimp per pound, and the large shrimp include 16 to 20 to a pound. Our shrimp selection varies based on what is available. We typically carry pink, white and brown shrimp. Unlike the Maine variety, the Florida lobster does not have claws. This low-fat, white meat lobster features a distinctively sweet flavor. Our flavorful crab cakes are made from local blue crab meat, stuffing ingredients, red and green peppers, onion and seasonings. All of our crab meat comes from fresh-caught, local blue crabs. We carry delicately flavored lump meat, the largest pieces of white meat from the body. We also offer claw meat. This darker meat, mostly used for crab cakes, features a stronger, nutty flavor and has a natural brownish tint. Our cocktail claws (fingers or claw fingers with part of the pincher still attached) are perfect as breaded or deep-fried appetizers. Our live blue crabs are fresh-caught along the Gulf. Featuring a delicate texture, this richly sweet, succulent and buttery flavored meat is low in fat. Renowned as the most delicious crabs in the world, snow crabs feature a mild taste of succulent sweet meat. Every 10 pounds includes approximately 21 to 24 legs. Our soft-shell crabs are local blue crabs in their molten state. Soft-shells are crabs that have recently molted their old exoskeleton and are still soft—which means the whole crustacean is edible. These soft-shell crabs are just as sweet as the hard-shell blue crabs. We carry jumbo and whale sized soft-shells. A seasonal delicacy, stone crab claws feature a firm textured meat with a sweet, buttery taste. This luscious meat is low in fat and extra lean. Stone crab claws can be eaten hot or cold. Our smoked fish dip is fashioned from fresh mahi-mahi dolphinfish, mayonnaise, ranch dressing mix, Cajun seasoning, seasoned salt and lemon pepper seasoning. This delightful dip is excellent with saltines, buttery round crackers or on a salad. Flounder is a fine-textured, delicate fish. Its firm, flaky white meat is mild-flavored and extremely lean. This moist, lean, white-fleshed fish features a light, delicate flavor. Low in fat, grouper does not have a strong fishy taste—it is extremely mild. We carry black and red grouper filets. Found in deeper water, black grouper tend to be bigger than the red grouper, which are bottom dwellers. We carry both whole and smoked mullet. A delicacy in Florida, mullet is a lean fish with a firm texture, light meat and moderate flavor. With a firm texture, red snapper has white to pinkish meat with a mild flavor. It is very lean fish. We sell snapper filets by the pound. 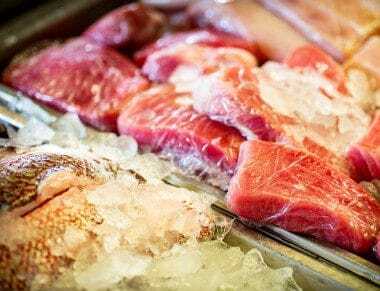 We carry yellowfin tuna loins or steaks. This firm, deep-red meat is incredibly flavorful. It is absolutely delicious grilled or seared and can be cooked rare to medium-rare. 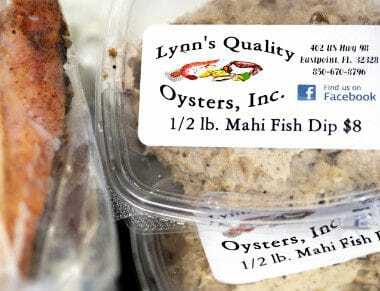 Here at Lynn’s, we carry ingredients and grocery items for all your seafood culinary needs! Whether you choose to prepare your seafood grilled, broiled or blackened, with Cajun seasoning, lemon pepper or seasoned salt, we’re a one-stop shop. We also have everything you need for your fryin’ fixings!